After some deliberation I’ve decided to start a baking blog. As luck would have it, this very week that I set out to start it we are in the midst of a major heatwave. It’s day 4. 102 degrees today. So, I decided to outsmart the heat and make an icebox pie. I found a delicious sounding recipe for a pina colada pie that suited me and I bought all of the necessary ingredients. It’s now 11pm, I’m in my pajamas, teeth brushed, bedtime prayers said and I’m filling a cooler with my goods to take the contents of my fridge and freezer, including the cursed Pina Colada Pie, to my office kitchen. First thing this morning, I was able to snap some requisite pictures of the pie for the blog. I encourage you all to try this yummy treat, but just don’t do it during a heatwave. 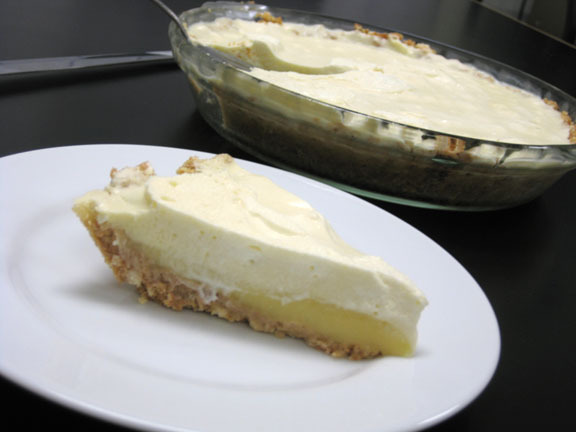 This entry was posted in Baking Jumbles and tagged icebox pie, pina colada. Bookmark the permalink. 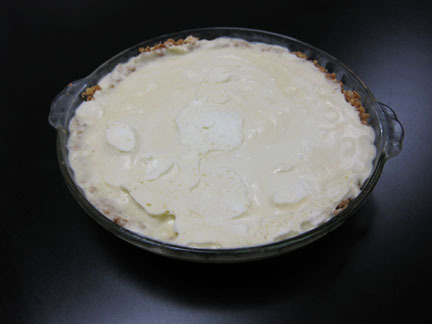 8 Responses to Pina Colada Pie – my first post! Ha ha! I’m laughing in my head for a couple of reasons. First, same thing happened to me making dinner tonight with the power going out. And I thought, “Really, how much heat can one stove burner generate?’ And now I’m dripping with sweat. Second, I’m laughing because this sounds like such a typical Kristin-esque adventure that would have occurred once upon a time in college! I like your blog idea…will you be updating your posts through facebook, too? Oh so I’m not the only one? 🙂 I don’t think my blog will be connected to my facebook posts (at least not for now) – I don’t want to innundate people too much. But you’ve given me something to think aboutk, maybe I’ll reconsider that since I only expect to post about 1x/week….. Funny you started this blog. I just saw Julie & Julia this week. Work is gonna love to reap the benefits of your hard work!! Did you haul your booty to the office at 11:00 in your “jammies”? How was the pie? Did you decorate it w/ umbrellas? 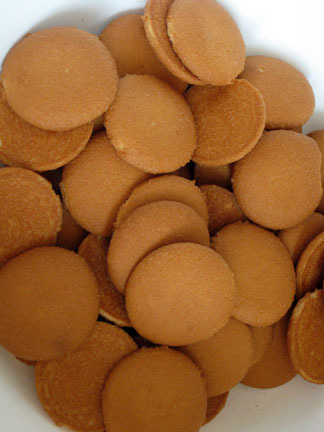 Is there any left or did they snarf it up at work? yes, I hauled my sleepy self to work in my jammies (granted i sleep in a tank top and shorts). Work almost always reaps the benefits of my baking, and they scarf it down pretty fast. Pie was good, refreshing in the summer heat. I enjoyed that movie, Julie & Julia. That, howver, would be quite an undertaking! Congrats on your new blog. Pina Colada Pie! It sounds delicious and I’m glad it turned out despite your troubles in the kitchen. I wish I could see a larger close of that pie slice. mmm! Thanks Monica! I am still learning how to insert pictures into my blog, so hopefully future posts will have larger images. Thanks for the comment! Oh no! I’ve had more kitchen experiences like this than I care to remember. Even last week, while my son was trying to make the three musketeers bars, we kept losing electricity because of the heat and rolling blackouts. We stuck it out and I bet your co-workers are glad you did too. The pie sounds perfect for a hot summer day. Congrats on starting your blog. I hope you have fun with it!